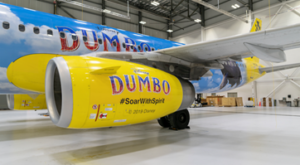 the beloved Disney character Dumbo.Spirit and Disney revealed the new plane with a time-lapse video of the decal-wrapping process which took place at Spirit’s state-of-the-art Detroit maintenance hangar. t and most fuel-efficient in the country. The plane takes off today from Detroit Metro Airport (DTW) to Orlando International Airport (MCO). Guests traveling between Detroit, Orlando, San Juan, Fort Lauderdale and Baltimore/Washington will have the chance to fly with “Dumbo” on the first three days of service. The aircraft will then travel across the country for the next two months, celebrating the movie’s release on March 29, 2019.
ming and spectacular aerial artist, Colette Marchant (Eva Green), until Holt learns that beneath its shiny veneer, Dreamland is full of dark secrets.